Open Vendor – Allows the user to open the vendor to see all information including purchase orders not yet closed. Navigation – Navigates from vendor to vendor in the order that the list AP list was in. Contact Info – Shows the vendors current contact, credit and year to date purchases. Add – Adds an entry to the vendors AP. Apply – Applies payments or vendor credits to an invoice. Void – Voids selected transaction. Does not work for AP entries derived from a purchase order. Show – Shows open, all or ‘All since fiscal year’ entries including paid and applied. Payment is shown first with the invoices indented below. It is very clear what invoices the payment included. Expand All – Expands the links for all transaction so as to see the invoices and related payment. 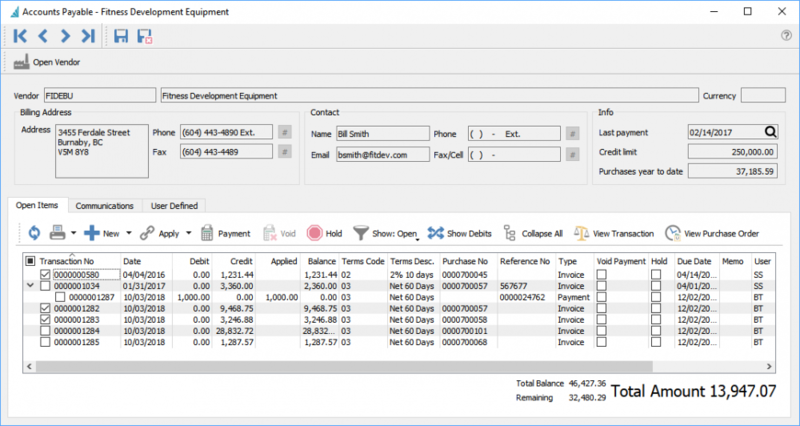 View Purchase Order – Views the purchase order for the highlighted transaction. If the PO is not closed it will come from the purchase order list and can be processed in this screen. If the PO is closed then it will come from PO history so will not be editable, but can be credited or copied. Notes – Any number of notes can be added to accounts payable.